The Conversation is fact-checking claims made on Q&A, broadcast Mondays on the ABC at 9:35 pm. Thank you to everyone who sent us quotes for checking via Twitter using hashtags #FactCheck and #QandA, on Facebook or by email. Senator-elect Pauline Hanson faced heavy questioning on Monday night’s Q&A program during a broad-ranging and often heated debate about Islam, radicalisation and terrorism [APR editor’s note, MDN: Hanson was expelled from the Liberal Party of Australia in 1996 for offensive comments about the Aborigine people of Australia. 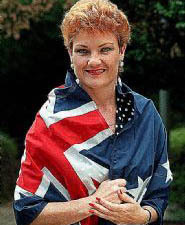 She is the leader and founder of the Australian political party One Nation and has made a career out of controversy. She has been denounced by the indigenous Aborigine community and many other Australians as an ignorant bigot catering to anti-Aborigine, anti-Asian, and anti-Muslim perceptions by making proposals to discriminate against them and by voicing her opposition to immigration.]. Hanson criticised the Grand Mufti of Australia, a senior Islamic scholar, for not condemning recent overseas terrorist attacks. In response to a question from a Muslim audience member, Hanson said that “your Grand Mufti won’t even come out and condemn the terrorist attacks that’s happened overseas”. The Conversation asked Hanson’s spokesman for sources to support her assertion, but did not hear back before the publication deadline. However, we can test her statement against publicly available evidence. Who is the Grand Mufti and what has he said about terrorism? The Grand Mufti of Australia is Dr Ibrahim Abu Mohammed, an Islamic scholar from the Australian National Imams Council (ANIC). ANIC is made up of Imams from across Australia representing their respective communities. We would like to convey our deepest condolences to the families and friends of the deceased. We reiterate that the sanctity of human life is guaranteed in Islam. These recent incidents highlight the fact that current strategies to deal with the threat of terrorism are not working. It is therefore imperative that all causative factors such as racism, Islamophobia, curtailing freedoms through securitisation, duplicitous foreign policies and military intervention must be comprehensively addressed. Critics said at the time that this initial response to the Paris attacks didn’t go far enough or appeared to blame Western society for the attacks. Previous and subsequent statements issued by ANIC and the Grand Mufti have condemned terrorist acts and other forms of violence committed overseas. More generally, the Grand Mufti has supported a fatwa (or Islamic legal ruling) against joining Islamic State. It is worth noting that the phrase “your Grand Mufti” is also misleading. It may convey the idea that the Grand Mufti of Australia represents all Muslims in Australia. That is not the case. In Australia, Islam has no easily defined hierarchy and ANIC is not the only body representing Muslims or Islamic scholars in Australia. According to my research, many Muslims in Australia support and respect the position of the Grand Mufti; however, they do not always support the person in the position or respect their religious credentials. According to the 2011 Australian Census there were 476,290 Muslims in Australia, of whom about 40% were Australian born. The rest came from 183 countries, making Australian Muslims one of the most ethnically and nationally heterogeneous religious communities. There are also significant divisions in faith. The same report said that while most Australian Muslims are Sunni, there is a significant minority of Shi’ite Muslims and smaller numbers of Bektashis, Ahmadis, Alawis and Druze. Lastly, many commentators and observers have advanced the view that it is unfair to expect Muslims and Muslim public figures to repeatedly publicly condemn every incident involving Muslims around the world. Pauline Hanson’s statement that “your Grand Mufti won’t even come out and condemn the terrorist attacks that’s happened overseas” was not correct. Clarke Jones is the co-director of the Australian Intervention Support Hub (AISH) at Australian National University.